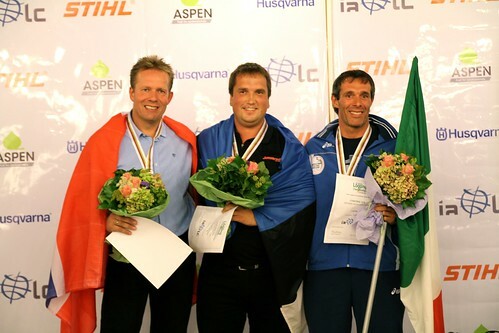 Here's an interview with the winner right after the medal ceremony. Hannes Lokko from the Husqvarna crew helps us with the translation. 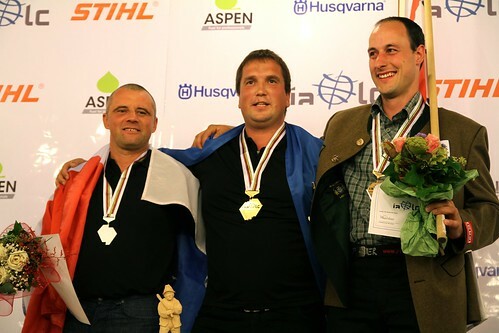 We from the Husqvarna Loggers Blog would like to congratulate Andres Olesk and Jonsered to the gold medal. We are very impressed! 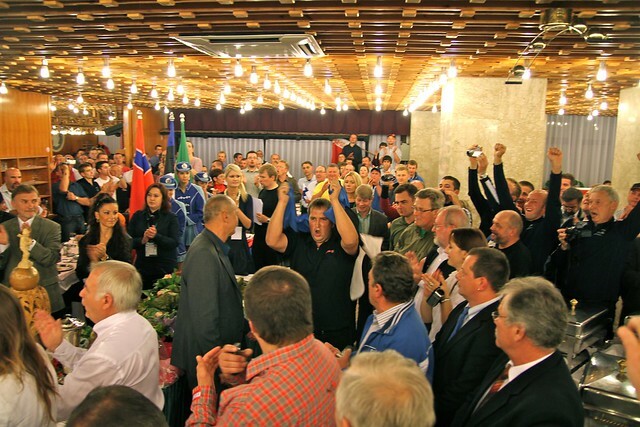 See you all in Belarus for the World Logging Championship 2012. 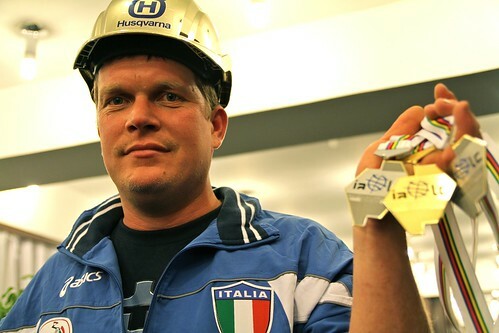 After all the medals had been handed out, we just had to have a final analysis from our expert commentator and dear friend Anders Kragner from Husqvarna. We sat down just outside the venue where the medal ceremony was held and had a chat with him. Take a look at our conversation! The total score prior to Limbing, that determines the starting order in this final discipline, had resulted in giving us two great duels. Well, of course there are four participants in each race, but in these two races there are two loggers in each that you know very well. This gives us a little extra interest in these races. First out is a battle between the old and the young, the experienced and the newcomber. Closest to the camera you see the Swedish logger Lars Strandell, one of the most experienced participators of all time in the WLC. On the lane furthest away you see the young talent Florian Huster from Germany (read an interview with Florian here). This is going to be a close race. Who will come out on top? Take a look! 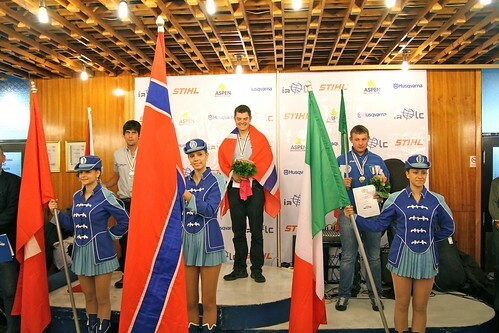 Many have stated that this year's World Logging Championship belongs to the junior participants. 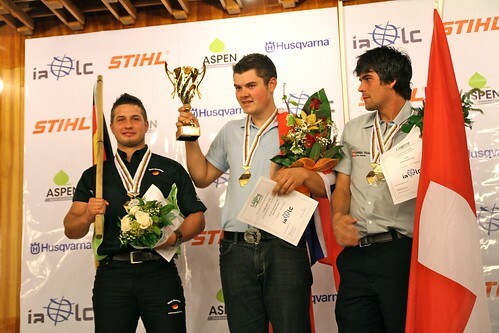 Not only did we get a world record set by a U24 participant this weekend (Ole Harald L. Kveseth in Fitting another chain), we are also struck by the way all the U24 results are definitely comparable to those of the senior participants. Two of our most interesting junior participants are these two: Gediminas Statsiumas from Lithuaniua, who managed to get a gold medal in the Bucking with combined cuts, are facing Lasse Kjaer from Denmark, who received the gold medal in Precision bucking. Interviews with both of them can be found here. Only two points set them apart in the total score prior to this discipline. Every second will be extremely valuable. Ready, set go! 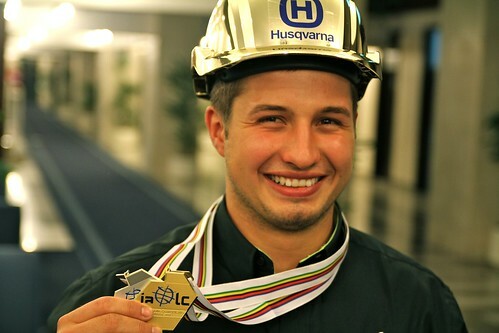 On the Husqvarna Loggers Blog we have highlighted a lot of loggers from all over the world, especially during this weekend in Zagreb. We then of course wanted to film some of the participants that you already know on their limbing performances. 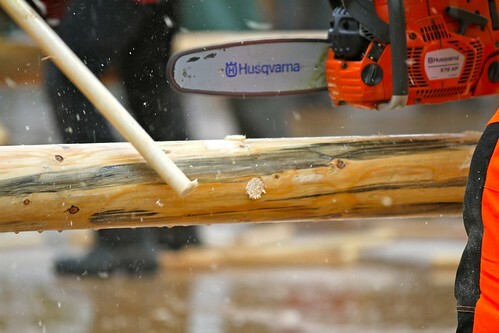 Below you can find three of our dearest Husqvarna/Jonsered users. Will they make it in the final discipline? 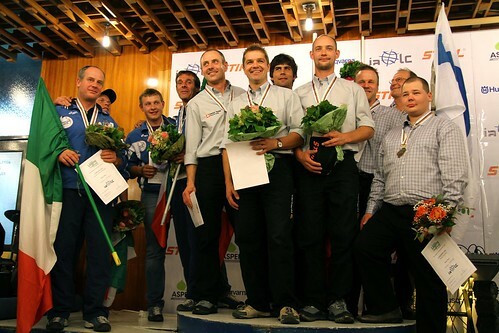 The Slovenian logger had the starting numner 75 in the Limbing discipline (we hope you remeber the inverted starting positions relative the total score so far). With a total score of 1130 so far, Domine needed to advance. Take a look at his performance. This is our friend Arjan Essenstam, who you all know from Thursday's blog post where he helped us explaining the rules and strategy for all the five disciplines. If you want to, you can take a look at it here. Arjan then claimed the Limbing to be his favorite discipline. He didn't expect this weather though. Does it affect him? Take a look. The happy Danish logger Ole Kjaer did manage to get rewarded with a gold medal for his achievement in the Precision bucking discipline. 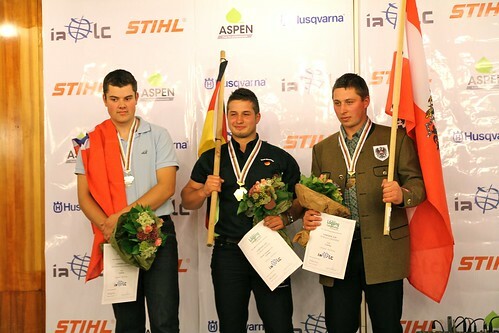 Take a look at an interview with him right after his Tree felling or take a look at his comments on the gold medal. Now he wants more! It's time to perform in limbing. Will he will more medals? 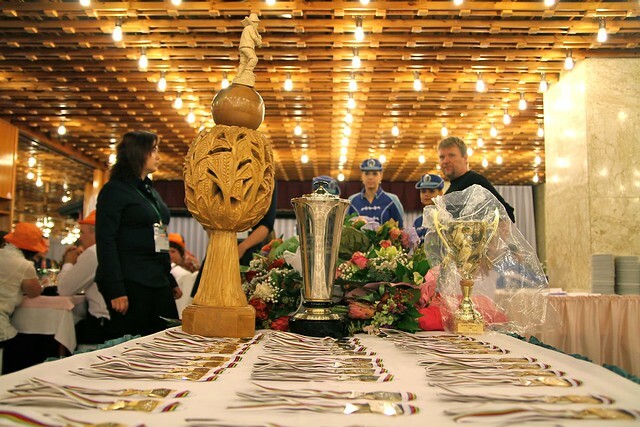 There are many people involved when it comes to events like the World Logging Championship. For Husqvarnas part, there is a lot of actions that needs to be taken care of: The large display area had to be built and staffed all the time, the participants needs a lot of assistance for their discipline performances and of course you also want to meet all the visitors and easpecially the visiting Husqvarna dealers and stakeholders. Many of the Husqvarna crew have travelled from Sweden to attend, but the event couldn't have been possible without the help from the Croatian partner and distributor Drezga Company, represented by Martina Drezga. We let Anders Kragner, Martina Drezga and the marketing manager from Husqvarna, Sven-Erik Bengtsson, have a litte chat together the last day of the WLC 2010. Anders looks pretty comfortable in the reporter position. Maybe a future career? It was finally time for the Limbing discipline, the last of the five that counts into the total score. 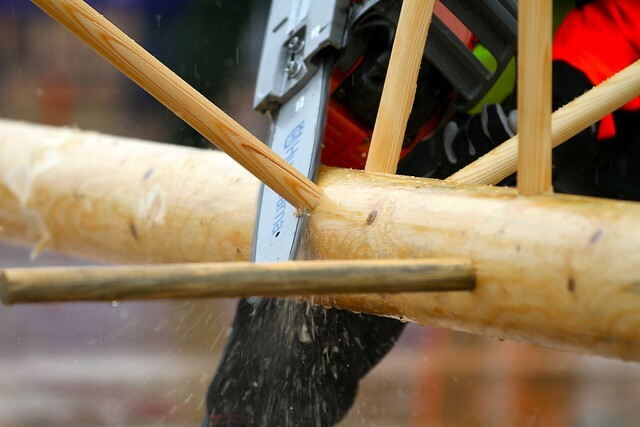 Limbing is together with the Tree felling the discipline where most points are at stake, which makes it extra thrilling! To raise the bar on excitement even further, the staring postions are arranged so that the participator with the lowest total score so far starts first and the total leader starts last. 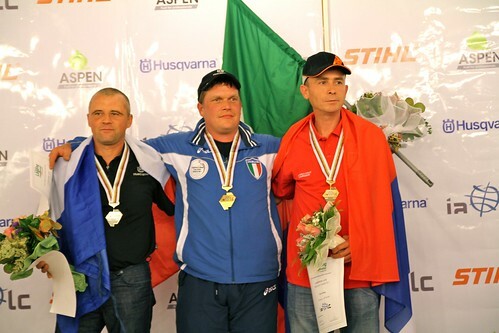 122 participants are competing and in the very top we have Hans (Johann) Raffl from Italy with 1220 points so far. This therefore give him the very last starting position (122). We got to the competition area when Jukka Perämäki from Finland with the starting number 33 was about to perform the Limbing. Here you can take a look at his race and get an idea of how the discipline works.